Just a while after my post yesterday, Valo had another attack. For some reason she cannot breathe through her nose anymore and she ends up gasping for air through her mouth. It’s a very disturbing sound and sight. I’ve been to the vet for this, more than once, and she has gotten 2 cures of antibiotics for it. While she’s on the cure, things are usually fine, but once she gets off it, the attacks just come back. The cause isn’t exactly clear, the vet thinks she has a small tumor in her nose, and it can congest the whole airflow. They cannot actually look for it as her tiny nose is too small to look into or even take x-rays of. If she’s really lucky, she also gets a heavy nosebleed. Yesterday I was walking to the bathroom when I heard a snort that didn’t sound like Maarit’s snorts. I looked at the cage and saw it was Valo. When she has these attacks, I usually take her out of the cage, try to give her nosedrops and keep her calm. Yesterday, after the nosedrops, her nose quite quickly opened up, but then the bleeding began. Even still, the bleeding wasn’t too heavy, so after she had started breathing normally again, I put her back in the cage with Maarit. I did find some bloody splatters all over the cage later, but it wasn’t a heavy nosebleed. This is a video I shot when she first started having these attacks. The vet asked me to film it so I could always show them. When I checked on the ladies later that night, I again noticed some blood coming out of her nose. It was just a few drops again, but I couldn’t imagine her feeling good, so I gave her some painmeds and put her in the miniduna for the night. When I woke up this morning, she seemed ok again. She had completely messed up her cage, and was hiding under the fleece on the bottom, but she had eaten, pooped and drank, so I figured she felt good enough to go back to Maarit. Her furr had come back down, which is also a sign of them feeling better. She wasn’t in the cage for more than 30 minutes when I heard her again… The poor thing had another attack. I didn’t think twice, I picked her up, gave her nosedrops and put her back in the Duna. I feel bad for robbing her of her little playmate, companion and her own safe space. But about 10 minutes after I put her in, she started breathing normally again. So I guess I am keeping her in there for another day, just to make sure she recovers from all this. And tomorrow I shall stop by the vet to get some new meds. 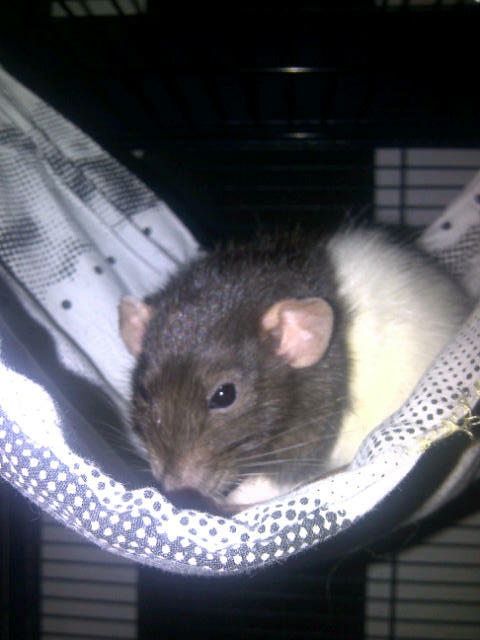 About 4-5 weeks before Christmas time, there was a topic on the forum about rats that I frequent, that had a link to a christmas-charity website for rats that are in shelters. There was a long list of pictures of rats in several different shelters, with the option to either send a care-package, financially adopt or officially adopt one of the rats. 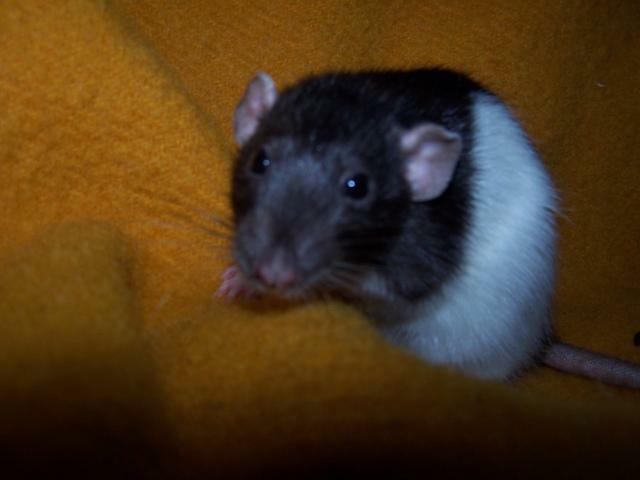 Not all rats were adoptable, but my eye happened to fall on a little girl named Marit. The picture they had posted of here was too adorable to pass. As you all know, I had been considering getting a new rat (or two) for quite some time, and after mulling it over for a few days, I sent in an adoption form and from then on emails went flying all over the place and before I knew it, I was allowed to come pick her up, an hour’s drive away from where I live, the first weekend of December. She was already 2 years old, had been in the shelter for over a year, and spent the first months of her life in a cage that was WAY too small, in a cold garage where she got no attention at all. Poor thing. But then, two days before I was about to go pick her up, the lady from the shelter sent me a email that she had found a lump, which could mean she had a tumor and if so, she would need surgery. So we postponed my pick-up date and I told her to give Marit a good deal of time to heal after surgery. Luckily, surgery went very well and Marit recovered quickly. But, by the time this had all passed, it was almost time for my surgery on my hand. So I didn’t want to have an introduction going on when I couldn’t intervene with my sore hand. We postponed my pick-up date again, until after my surgery. Then, the day of my surgery, I came to the hospital and it turned out I was misinformed and I wasn’t going to get surgery until the second week of February. Once I got home, upset and frustrated, I emailed the lady from the shelter and I made plans to pick up Marit that Saturday, and I did. When I first saw her, I was a little shocked at quite how small she is. She is even smaller than Ruma and weighs less as well. 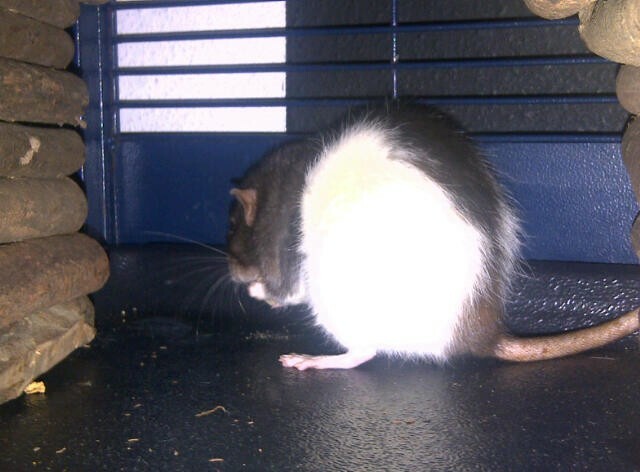 She is a little hunched, like in the picture, has Japanese hooded fur and dumbo ears. She was VERY scared when I picked her up and I instantly got covered with poop. But she was so adorable. Only one of her stitches was still in place, the rest had dissolved neatly and her fur was growing back in the area of the surgery. She still had her fur standing up, from either discomfort or stress, not quite sure, but the poor thing surely wasn’t feeling too good. And then we started the long journey home. I stuck my hand in the carry-on basket every now and then and talked and sang to her the whole way back. Once I got home, I instantly put Ruma with her and the two hit it off right away. Marit has been here for a few weeks now, but it hasn’t been easy. I started introduction with Ruma, in a small cage, called a ‘mini-duna’ which I had purchased for this purpose and also for when one of them would get so sick they’d need to be separated. Ruma and Marit went great together. They sniffed a little, but very soon were lying in a corner together, bruxing and boggling. Marit’s fur went down very quickly and I knew these two would be great together. I kept them in there for about 3 hours and then added Koko to the mix. This seemed to go just as well, and impatient as I was, after only another hour, I moved them back to the RS. Even still, things seemed to go fine and the next day I made the cage twice the size. That’s where I went wrong. Suddenly the fighting started. I had never heard a rat scream and squeal like a little pig, but Marit did. On the forum they advised me to quickly make the cage smaller and after some hesitation (took me a few hours to get it ready), I did and besides a bed and food and water, I took everything out of the cage. Nothing left to fight about. The next day I got a visit from a friend, for dinner, and for a while, things seemed quiet. But then again, the fighting started and it was BAD. Hair was flying around and Marit and Koko were rolling around the cage so fast I could barely keep up. 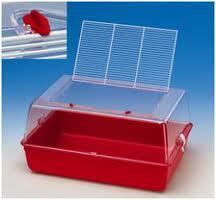 One time, Marit even fell from the little floor that was in there (about 25 cm high) and got a nasty cut on her back. I decided it was enough and put them back in the mini-duna. They ended up staying in there from Monday-night until Saturday-morning. No more fights luckily! From another shelter that I had visited to do a donation (another story), I was able to borrow a bigger Duna. The normal sized one, to take the next step in their introduction. I put them in there on Saturday and as things went well, I slowly started adding things to the cage, like a hammock and later a Sputnik XL. They seemed to have become friends, so on Tuesday, I moved them back to half a Royal Suite. I slowly started adding things to the cage, one a day, like the Silent Spinner, and more hammocks. I started noticing they didn’t always sleep together, but that didn’t really worry me too much. Marit seemed to warm up to me, she would also come running to the door when I opened it, not as fast as the others, but always ready to receive a treat. I still couldn’t take her out of the cage much, because she would run and hide as fast as she could, but I figured this would just take time and patience. When I did take her out, she still had the habit of pooping all over me :(. The first days went great. 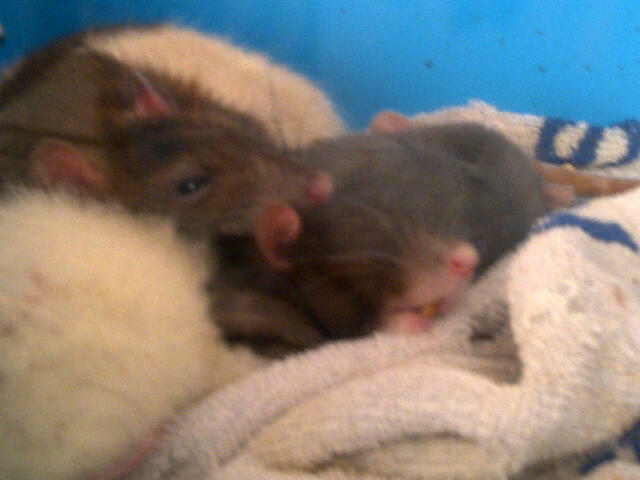 They ate, pooped, drank and slept (together) and it seemed to have been a successful introduction. But then, everyday, I started noticing things. There would be a fight, Koko would have her hair standing up and threaten either Marit or Ruma, Marit would always be sleeping alone and more little things like this. On the forum they told me to be patient, maybe take out some beds from the cage and see what happened. 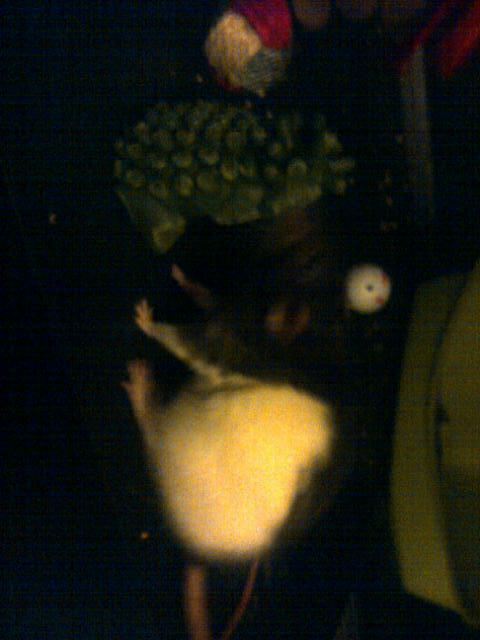 Marit nibbling at the hedgehog, ot a good pic, but you can see how small she is. Then the other day, I had them all on my bed. Marit was happily exploring under my blankets and Koko came to join her. Instantly, Koko put her fur up and started pushing her. Marit would just make herself as small as possible and not move, hoping Koko would go away, but she didn’t. Eventually, Marit crawled into my shirt. Koko came towards us and then I caught her BITING Marit!!! I was so shocked! My Koko, biting! She wasn’t wounding Marit, but very clearly showing her disapproval. Obviously I didn’t let her and I instantly stopped this. Marit was so frightened after this. I kept her in my shirt for a while, until she felt safe enough to peek out again, and then returned her to the cage. Later on, I seemed to notice that Koko was locking her in the ball (they sleep in it as mentioned before). I wasn’t sure, so I moved the towel that Koko had been sleeping in, which was right in front of the ball, to the corner and checked again the next day. The towel was back in the same place, but I couldn’t be sure who did it, because Marit was always pulling it into the ball as well. So I left it like that. In the mean time I had emailed the lady of the last named shelter, who loaned me her cage, to ask for her advice. What to do, because I could see Marit wasn’t happy, nor were Koko and Ruma. She told me I could come by and we could see of there was another rat there that Marit did click with. We made plans, but then I realised my surgery is coming up and I couldn’t be having an intro again here. She very sweetly offered to keep Marit for a while, if we were able to find her a friend there. I was to go over there on Saturday. Then, last (Friday)night, when I let the ladies free range again, I noticed something that made me worry even more. Marit was on the bed with me, and Koko was nowhere to be seen, but Ruma came to say hi. Marit again made herself as small as possible and started pooping instantly. It was obvious fear-poop. Ruma, as far as I know, has never hurt her, she only grooms and cuddles, so I was quite shocked to see Marit behave like this. I realized she was just simply scared out of her mind for both my rats and I couldn’t put her back into the cage with them. So, I put her in the Duna, since it was just going to be one night anyways. I am going to the shelter today, and hopefully we will find Marit a new friend so she can spend her last weeks/months, maybe even year, happily together with her new friend. Marit in a hammock in the RS. Love this sweet pic. This does mean I will have 2 groups of 2 rats, instead of one group of 3 or 4, as I wanted, but if this is best for the rats, this is what I will do. Either way, the RS will be in full use. I have enough to fill the cage, so it shouldn’t be an issue (except for the bottom plate that I need to get…). Not the way I would have liked to see it, but their happiness means more to me. So, I will keep you updated on the new developments! What to do when you’re in an introduction? Gill's thoughts and reflections . . .
That Firefly Phil bloke, still knocking out photography and other stuff. Well, someone had to say it. Fond memories of a Bluebird group- all grown up. A blog about writing and other interesting stuff.